Hi crafty people! It's Lisa back with you for another exciting edition of #TexturalTuesdays. Yay! I thought it would be fun to show you how to create a nifty little tag using some cool texture-y stuff and a new technique. Sound like a plan? Let me first show you my tag using Julie Ebersole's awesome Got Candy Stamps & Dies that are exclusive to Ellen Hutson LLC. I'm so batty for those little bats!! :) So sweet...oh wait, I mean SCAAAARRRY!! 1. From Bazzill Licorice Twist cardstock die-cut a few of the little bats and put them aside. I usually cut at least one more than I need. 2. Since I recently moved and can't locate everything I need, I am using what I DO have. I used the Essentials by Ellen Mini Windows by Julie die to create the mask I needed for my moon. I just rotated it again to create the full circle since the die actually creates a 'hinge" for a window. 3. Once the mask is in place, use Gelatos® in colors that are pleasing to you (I used Orange Soda -from the Brights Collection and Banana - 50's Diner Collection ) and blend the two colors together using your finger. 4. The Metallic Gelatos® look amazing on black and will make for an eerie background. Using the Gelatos® in Metallic Melon, Grape, and Mint rub the color all over the tag and, again, blend with your fingers. 5. Place "brick" stencil over lower half of tag and using metallic silver pen draw with pen just inside the lines of the stencil to create pattern. 7. NOW for the super cool part! ;) Using the Chalkboard Paint straight out of the jar let it drip onto the tag over the area where the Silver Texture Luxe was applied. Then MIST it rather heavily. Move the tag around to let the mixture move around. Dab it with a baby wipe to assist in the blending. Heat set with a heat tool. or air dry. 8. Add tiny dots of Daffodil Liquid Pearls to make the eyes of the Bats. (Soooooo creeeeeeepy!!) And add one 3D Foam square to the back of each Bat. 9. To make the moon even more dimension, first add wispy clouds around the moon with the Stamper's Big Brush Pen in white and blend with your finger. Then fill in the moon with Glossy Accents. The colors make it look just like the blood moon! 10. The very last thing I did was stamp the Boo & the Eek with Versamark Ink and use the Wow! Embossing Powder to make it all pretty. That's it! It's a fairly easy tag to make, just gotta get your fingers a little messy with the Gelatos® and the Chalkboard Paint will get messy if you're not careful. Thank you for spending a few minutes with me today and I hope you learned a little something new today. Good Wednesday morning and welcome to the CLASSroom. Fall is just around the corner and that means kids will be looking forward to Halloween and trick or treating. My project today is a fun witchy tag perfect to attach to treats or gift bags. The tag was made using the Memory Box Pinpoint Main Street Tags and embellished with the Impression Obsession Witch Brewing and Swirl Tree. The tag base was cut using the new Authentique Moonlit designer paper and attached to a black tag with ATG adhesive. I love making frames for my projects and thought it would be really fun to place one on this spooky tag. Place black cardstock on the magnetic platform, line up the two tag dies and cut. Cut the branches off the Swirl Tree. Apply double stick tape to the back of the frame and remove the paper cover. Attach the branches to the back side of the frame allowing the branches to peak out inside the frame opening. Apply double stick tape to remaining back portion of the frame and attach to the tag base. Round the cauldron and witch lightly with your fingers to add dimension. Attach double layers of mounting tape to both sections of the die and attach to the tag base. I couldn’t resist making another quick and easy framed tag using the Impression Obsession Spider and Web set. It was made with another one of the fun papers from the Moonlit pad. Here’s a shot of both tags with a little bit of spooky lighting. Thanks for coming by today and I hope you have been inspired to make some fun Halloween tags of your own. Hi! Carly here for another #throwbackthursday! Enamel dots and epoxy shapes are a favorite embellishment of many of our amazing designers and I was curious about creating my own. I searched "diy enamel" in the classroom and found this great article from the fabulous Miss Julie Ebersole. Julie included great tips and I thought it would be fun to create some custom faux epoxy/enamel Halloween embellishments with the new Essentials by Ellen Clear Stamps Got Candy? and I was right, it was! To create my little embellishments, I used the Poppystamps Dies, 4 Windows to die cut rectangles from Solar White cardstock. I stamped images from Essentials by Ellen Clear Stamps Got Candy? set with VersaFine Onyx Black, Grape Jelly & Tangelo Memento ink. Next I used the Poppystamps Dies, 4 Windows die again to cut more rectangles, this time from Essentials by Ellen, Craft-a-Board. Then I adhered my stamped rectangles to my Craft-a-Board ones and as Julie recommended in her article, glue stick works best for this. With my rectangles ready, I glue dotted them to my non-stick craft mat (its easy to peel the glue dots off the Craft-a-Board later,) to make it easy to apply the Glossy Accents. Then I applied a thick coat of Glossy Accents, trying to apply it all in a steady stream, right up to all the edges. Applying all in one steady stream helps prevent air bubbles but if you do get a few, you can use a pin to drag them to the edge. (TIP: if desired, this would be the time to sprinkle a little glitter or a few micro beads into the wet Glossy Accents.) And then I let dry overnight. To create my card with my finished faux enamel accent, I used the Poppystamps Dies, 4 Windows die again on my card front. I watercolored the inside of my card with Spiced Marmalade Distress Ink. I die cut the speech bubble from Essentials by Ellen Designer Dies, Got Candy? set, stamped "Eek" from the Got Candy? stamp set in VersaMark and embossed in white. Then I die cut a second speech bubble. I glued the embossed bubble to the front of my card and then plain bubble behind, sandwiching the card front between them. Next I added a little twine "web", coming from the inside of the front of the card and using Glossy Accents to glue it down. And the finishing touch, a sentiment and sequins! Check out more epoxy and enamel embellishments in the store by clicking this link. Hi! It's Carly and I'm thrilled to be here today for the beginning of our new #throwbackthursdays! I'm excited to revisit and re-imagine ideas from past blog posts and our family of super talented designers!!! The Ellen Hutson blogs are like a GIANT idea book right at our finger tips that we can search for inspiration, techniques, information and of course, ideas! For today's card I needed a little Halloween inspiration so I typed "Halloween" into the search bar at the top right of the blog. 1. First I started with a 3.5 x 5 card using Solar White cardstock. To create my background, I masked a rectangle on my card front using Inkadinkado Stamping Mask Paper but Post-It Tape or Frog Tape would also work well. With my Ranger Ink Blending Tool, I applied Distress Ink Shaded Lilac and Twisted Citron. 2. Next I misted my card with a bit of water to further blend my Distress inks and I added a few big drops by unscrewing the bottle and tapping the sprayer over the background. 3. While my background was drying, I die cut. From the Black American Crafts Pow! Glitter Paper, I cut the Memory Box Dies Batty Border and the Memory Box Dies Grim Cauldron. Using Solar White cardstock I cut the Memory Box Dies Witch Kit. And then I cut the Witch Kit again using Desert Storm cardstock. 4. To add detail to my die cut pieces I used the Ink Blending Tool to add Distress Ink Spiced Marmalade and Twisted Citron to the potion bottles. Then I gave them a good coat of Glossy Accents and set them aside to dry. I also added a little detail to the broom with a Clean Color Real Brush Beige 072 marker but a similar color Copic or Pan Pastel would work well too. 5. To make my clear rhinestones match, I gave them a quick color with Copic Sketch Marker YG23. 6. I assembled all my pieces together over my dry background, adhering the bottles and broom first. And then I 3D mounted the cauldron over them. 7. Inside I used Mama Elephant's Bella Letters to stamp a cheeky message but Happy Halloween would be cute too! To find more Halloween stamps and dies in our store use this link! Thanks so much for joining me for our first #throwbackthursday! I made a commitment to myself to be more involved in my son's school this year. I love volunteering once a week during my lunch break in his 1st grade classroom and getting to know each of the kids and their teacher. The next day I'll be in the classroom is Halloween and I thought it would be fun to give each one of the kids a fun bookmark! So yes, I made 24 of these suckers! I recently got my hands on a few new goodies - the new Mama Elephant Tags a Lot die set and the Lawn Fawn Monster Mash stamp and coordinating die set. The new Lawn Fawn Monster Mash stamp set is extremely versatile - not specifically a Halloween set but it lends itself to birthdays, Valentines, Get Well too! I love when I can get a lot of bang for my buck. Mama Elephant dies are always packed full and designed perfectly! I thought it would be fun to pull this one apart and show how much is in this set. They snap apart easily by twisting or using some snips. To create the base of my bookmark, I used one of the tag shape dies. I wanted a little bit smaller canvas to work with since the images are a bit smaller. To create the background for the monster to be in front of, I die cut the cloudy shaped border from the Landscape Trio die. I simply cut 4 strips from one piece of 8-1/2x11 cardstock to create strips to work with. Then, I simply ran them through my die cutter again using the tag die to create the stitched border. I did the same thing with the medium grey to create the ground. Then I assembled all the layers to create the bookmark base. Next, I stamped a bunch of the monsters. I didn't get pictures of it because there would just be so many is the coloring of all the different monsters. Since there were so many, I just played with my Copics and found color combinations that I liked. I die cut the monsters out and then stamped a cute sentiment on each one. To finish each one off, I punched a hole in the top of each tag and ran bakers twine through each one. Then, to each monster, I added a little glitter and some white gel pen accents. Here they are in a book - too cute! Thanks for stopping by and sharing part of your day with me. Have a great day! Today we are thrilled to welcome Catherine Pooler here to the CLASSroom and have several fantastic giveaways just for you! Catherine is the founder of StampNation, an online community whose membership learns, creates, plays and connects with one another. Catherine's passion for stamping and teaching comes through in her all of her creations and videos. Catherine recently launched her new look and improved site catherinepooler.com and is throwing a fabulous housewarming party! We are proud to be one of her sponsors and are giving away a $50 Gift Certificate to our store! So be certain to head over and join in the fun! For complete details head to this post. For all those of you who are joining us here today we are giving away the opportunity for you to join in the fun over on StampNation! By simply leaving a comment on this post today you will be entered in to a random drawing for a one-month membership to StampNation! Please leave a comment on this post before Friday, September 19th to be included. Catherine has another huge treat in store for you when you visit her blog - she has another project AND video awaiting you there so be certain to head over to Catherine Pooler's blog now! As our way of thanking you for taking the time to visit Catherine's blog we have a package of goodies awaiting your there. Please help us thank Catherine by leaving a comment on her post about being a guest here by September 19th to be included in the random drawing she will be hosting there. You know you are in the right place if you see the following picture of our giveaway. Hi Friends! To say that I’m excited to be a guest in Ellen Hutson’s CLASSroom today would be an understatement! The products I got to work with here are so super fun! The stamp set was like playing with paper dolls, the additional images work perfectly with the doll and with the two sentiments, you can’t beat it! You may notice that I tweaked up the sentiment from how it comes in the set…be sure to watch the video to learn more about that. I thought some paper piecing would be fabulous with this image and even used it with the bat. A bit of Delicata Gold stenciled on to the background made a subtle, yet still glitzy pop. The real show-stopper here is the circle accent piece. Gold Mica Flakes embedded in Translucent Embossing Paste. oh, WOW! In the video, I actually thought this wasn’t quite dry yet…see the white-ish part northeast of her elbow? That is just Mica Flakes with a bunch of Translucent Embossing Paste over them! It is dry, but turned a milky white color. It’s always fun to play and experiment and find new ways to use any products you have. I hope you have enjoyed today’s tutorial and are inspired! Today our thoughts are with Julie, her mom and her family. Please continue to include them in your prayers and positive thoughts as they move forwards with their fight against breast cancer. This hits so close to home with the recent loss of my own sweet mom. I would like to take this opportunity to encourage you to please be vigilent in your own health care. As well, please encourage those who are older who may think they are past the point of ever getting breast cancer to do the same. 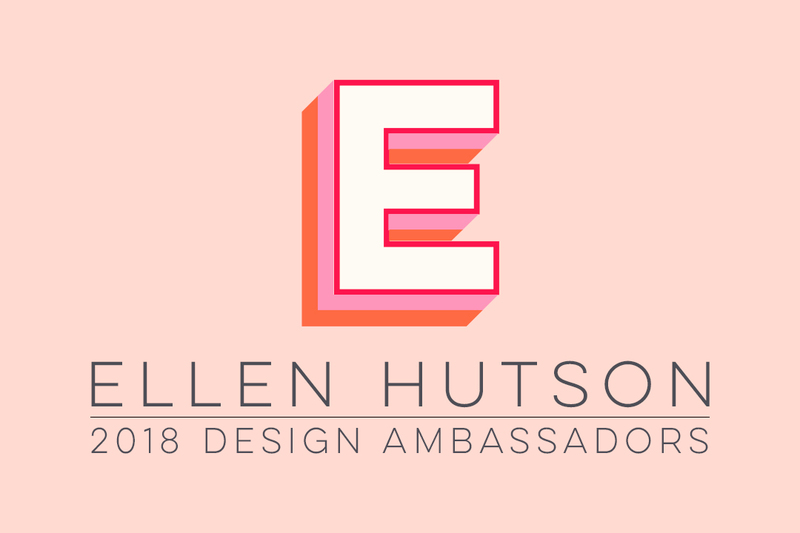 We are thankful for the support of so many friends during this time as colleagues step forward to stand beside us in their support of Julie and our team here at Ellen Hutson LLC. The creativity continues on and we hope that we can bring a smile to your faces through this time. So without further ado I would like to thank Jean Manis for coming to our aid today to bring you a spectacular and boo-ti-ful Halloween card! I am a very lucky lady to have Jean located right here in Issaquah. When Jean walks through the door Jasper (my little furry mascot who lives to "go to work" --- yep he gets SO excited to come here because he knows he is going to be the center of almost every conversation when someone walks through our front door) rolls over for some fabulous belly scratches. Jean and I talk techniques, trends, industry news and family. Not only is Jean a wonderful friend, but she is a very talented designer. Her clean, simple style has evolved over the last couple of years and it is a huge honor to have her share her project with everyone today. Her blog right as rain is filled with creative and inspiring projects - please head over and leave a comment or two on the beautiful projects she has created and shared there. Halloween is one of my favorite holidays. As a child and with my own children, I especially enjoyed trick-or-treating. There was something so powerful about the dark, the crunching leaves underfoot, and the glowing jack-o-lanterns on the doorsteps. It was only natural that I’d be drawn to the cute Trick or Treaters die cuts from Memory Box! I wanted to create an easily-assembled Halloween scene and die cuts make that possible. Because of the size of the Trick or Treaters, I added elements to the card that wouldn’t overwhelm the figures. The gate and fence serve as a backdrop for the duo and help ground them. I took some artistic license with the bats, which would be huge if I was being realistic, silhouetted by a die cut moon. The Trick or Treaters and bats are adhered with foam squares to add some depth. The background paper, cut with a square die, allows the black card base to create a frame for the scene. I heat embossed a sentiment from the versatle Hero Arts stamp set, which has a font style that echoes the font in the background paper. Although I kept my card simple with solid colors, it would be easy to add some bling. For example, the bats and witch figure could be cut from American Crafts Pow! Glitter Paper. Ellen had a great idea to add Distress Embossing Powder in Spiced Marmalade to the die cut jack o’ lantern for texture. I use Glossy Accents for adhering small die cut pieces; it dries clear and fast. While holding the die cut piece with the tweezers, I carefully applied the Glossy Accents on key points on the die cuts that were applied directly to the card background. With Halloween right around the corner, it seemed like the perfect time to play with some new papers and product. One of these products in particular has me really excited about it.The new Tim Holtz Mirrored is a reallly great reflective material that comes backed with adhesive and is thin, flexible and can be die cut. My mind is whirling at all the possibilities. And what's Halloween without a spooky mirror? Perfect timing, I say, to try it on a Halloween card design. The thing I was really excited to try out with Mirrored was so see how reflective it was and how well it die cut. I paired it up with the October Afternoon Witch Hazel line. There are so many great vintage prints in this line. I'm not big on anything too ghoulish so this line is just perfect in my opinion. It really impressed me how cleanly and easily the Mirrored product was able to be die cut. The above picture shows the die cut mirrors. It comes with a protective film over the mirror so leave that in place until you are ready to use it on your project. Make sure you leave the film on for die cutting. The left die cut still has the film on it and the right die cut has it peeled away. I wish the pictures captured just how shiny and beautiful a mirror finish this product has. I'm thrilled with it! In this next image I'm peeling away the protective film on the left die cut. The right die cut has been flipped over and the adhesive backing is being peeled away. It's so easy to adhere this product. Next onto creating the card. I've layered three of the beautiful prints together and sanded their edges for a worn distressed look. Worn and distressed and old always goes with Halloween in my opinion. Lastly I used the coordinating Witch Hazel chipboard stickers to make a quick banner over the mirror. The adhesive chipboard buttons can be stacked for added dimension. Thanks for joining me today in the CLASSroom! Have a spooktacular Halloween! Hello! The little Ghost Trio die jumped to the top of my wishlist as soon as I saw it! You can cut felt with them, cut patterned paper, but I really wanted to make glittery ghosts. I started by die cutting. I went ahead and cut Twiggy Tree at the same time. When I'm cutting detailed dies, I always add the Memory Box adaptor plate to help get all the detailed cuts. Now that I have a stack of ghosts, I want to add the glitter. I'm going to use one of my favorite methods for this, which is the Xyron. It's a little machine that turns your die cuts into stickers. The adhesive is perfect for glitter. It provides a strong hold, doesn't warp your paper, and has no dry time. Drop your items in the top of the machine and then manually pull paper out below. Peel back the cellophane and you're left with a sheet of stickers! Peel them off and cover them in glitter. Now I'm ready to add them to my designs. First, I chose to combine them with some Dots and Stripes patterned paper. I like non-traditional color schemes, so I went with light blue. Lastly, I combined the Ghosts Trio die with Twiggy Tree for a spooky scene. I embossed the sentiment in white and added small strips of patterned paper. This is the second house I have made using Eileen Hull's house by Sizzix and I find so much inspiration evoking in this case, a childhood memory, into a project I can share. I was almost eleven and a dear friend had decided to have a Halloween party at her grandparent's old house before the family had it torn down. I helped with re-creating a haunted feeling --- adding spider webs, vats of gelatin, wooden coffins, etc. It was as authentic as anyone our ages could make. We had a great time when the rest of our classmates came for the party and I really hated to see the house get demolished a month later. After that occasion, I saw haunted houses differently, knowing the family that had actually resided there. This replication I did for my Halloween table centerpiece reflects that feeling --- a little spooky, but also joyful. The urns, lining the path to the front door, with its "Welcome" sign, are full of brightly colored chrysanthemums. The smiling Jack O' Lantern on the fence looks mischievous! Jack the crow on the branch of a "Tim Burton-like" tree acts as the watch dog to anyone approaching, the pumpkin patches surrounding the house waiting for pies to be baked, and the graves with the familiar "pushing daisies" symbol, marks past ancestors --- Emma Gonner and Heidi Osamigo. Kale, maple leaves, sunflowers and all things beautiful we find in the fall surround the decrepid structure. Last minute gifts are always tough, and finding a way to package them can be even harder. Why not combine the two using some of your fun paper crafting products? A few miniature chocolates wrapped in beautiful paper and presented in a box that was made to match is an easy way to impress the recipient with your clever and sweet ways. Even if the interior hints at something a little more sinister, they won't be able to resist nibbling on a piece or two before dinner. The finished 4" x 5" size of these boxes will snuggle 15 little Treasures in ghoulishly delightful comfort. To wrap the chocolates in style you will need to cut 1" x 3" pieces of the different patterns of paper that you like. For the Halloween boxes I used the Hocus Pocus line from Pink Paislee. Prepare two pieces of patterned paper of your liking. For the bottom of the box you will need a piece that is cut at 7" wide and 8" tall. Take care in your planning if you are trying to center one of the designs in your project. For the top of the box you will need a piece that is 12" wide and 5" tall. Score the bottom at 3/4" and 1 1/2" from each of the edges. You should be left with an inside piece that is the same size and the finished dimensions of the box. 4" x 5". Fold the inside score up and the outer down. Then you will trim into the center along the inner score just into the box bottom on the top and bottom of the paper. Then place double sided adhesive tape along the edges. Remove the protective backing from the top piece of adhesive and fold it back onto itself along the score line. Repeat on bottom. Place four more pieces of double sided adhesive onto the "tabs" that were created. Remove the protective backing and adhere to the side of the box after you fold it up. Then remove the protective backing from the tape on the side and adhere into place. Remove backing from tape on the other side. Press into place and now the box bottom is complete. For the top, center your design if necessary and then score the top at 3 3/16" and 3 15/16" and 8 1/16" and 8 13/16". If that is making your brain hurt as much as it did mine to try to describe to you, the idea is that you want the top to be able to slide easily on and off of the box bottom. So the top needs to measure barely over 4" width of the box bottom and barely over the 3/4" over the depth of the box. Hopefully one of those two descriptions will get you there. Before I adhered the sliding top together I stamped on it and adhered some letter stickers for the sentiment. These are fun, easy and so very cute. Sit down and make a bunch at one time, then set a few of them aside for those unexpected situations when you need a gift in a hurry. If you don't have a fan of chocolate on your gift list, it is a great size for other types of treats, photos or for that someone special you could even make a matching mini-album. It is also easy to adjust the size if you have a little patience in doing some math. Just keep the scored widths the same on all four sides. Have fun and happy gift giving! Supplies Used: Hocus Pocus by Pink Paislee, Mitten Weather by Cosmo Cricket, Martha Stewart Scoring Board, Be Creative double sided tape, Black letter stickers are from the Life's Portrait paper crafting kit by Webster's Pages, White Trim from Prima Marketing. The optical lenses from 7 Gypsies are so wicked cool and I have many ideas floating through my brain since first seeing them in July. The first to surface is the use of these as "Halloween ornaments." Come Christmas time I have another whole new set of ideas, yep my brain is exploding and I can hardly wait to share those - ha! ha! Begin by applying the design adhesive to the lens surface by using the spatula end of the Rub-on tool. Mix together black ultrafine glitter and black flock. Apply and burnish with finger. Remove excess glitter and flock with a soft cloth. Add additional dimension to your piece by first applying a rub-on. Then flip over your lens and apply the design adhesive crow, flock and glitter. You must admit that these are rather cool looking! Hang as a window ornament, put branches and berries in a vase and hang these or put it on a chain and wear it as a necklace. Yes, you could even use it on one of your paper craft projects - LOL! Yes, I am having a barrel of fun! Thank you for stopping in and I hope that I have been able to bring a smile to your day! Yesterday when I arrived at work this fabulous project was sitting in our front office. I just had to share it with you as I think Carina did a fabulous job! I love seeing the pictures of her kids when they were younger carving their pumpkins! She used the Blackbird paper line together with some Martha Stewart punches to add interest to the project. I really like how she split the photo in the top right hand corner and added some "bling" to make the project sparkle. I hope this inspires some of you who have had photos of your kids at Halloween tucked away to bring them out and hang them up for the month ahead. Thank you so much for letting me share your beautiful project Carina!!! Start by adding color to the polka dot Invisibles paper. I rubbed the ink on with a circular motion. Once you have covered the paper with ink, rub off excess ink from the resist polka dots. Use a circle punch that is the same size as the polka dots...or one that is as close to the size as you can get. Use a larger circle punch to punch out a "scrap" circle template. On the back of the orange polka dot paper, line up the inner circle with your template and trace along the top of the outer circle. Trace paper or a ruler across the center of the circle and hand cut along the line. Stamp spider web, sentiment and spider in black onto green paper and cut around it so that it's slightly larger than the yellow base because it needs to go over the pencil. Punch 2 small holes through the green panel and the base at the same time. thread the twine through both holes at the same time and wrap around to the front. tie a bow in front and add a button accent to the center of the bow. this is what the back side will look like. You can add it to a card base and include a message inside. I am hoping that you will find these easy enough that you might consider making some for your child's class. Change the size of the holes to adapt to a lollipop, toothbrush or a stick of gum. Experiment and have fun! You've been seeing a few new Fall & Holiday stamps from Karen Lockhart and today I'd like to show you one of my favorites from this latest release, another in her series of "In The Window" stamps -- Halloween! I thought this image would be cute as a home decor sign or door hanger, so I picked up an inexpensive metal sign on sale at the craft store to alter. Alternately, you could always recycle something you already have or die cut Craft-A-Board into any shape you'd like and use that as your base. Above is how mine started out! I started by adhering some of Basic Grey's new Eerie 6-inch patterned paper to the metal sign, using decoupage glue. After adhering the paper to the sign, I also gave it a top coat of decoupage glue, to protect the paper. After coloring and cutting out the stamped image, I layered it onto more of the Eerie patterned paper die cut with Spellbinders Labels Two and adhered everything to the sign with more decoupage glue. Using Red Liner tape, I adhered the pom-pom trim. Then to finish, I wrapped silver tinsel pipe cleaners around the wire hanger, to give a bit of a festive feel. Happy Fall! I get excited about Halloween when I see all of the aisles of candy in stores, so I thought I'd create a card to prepare us for such a fun holiday. I realize that it's a not a huge card giving holiday, but why not, right? Cut Craft a board and Stamp pad foam to the same size as the web stamp. Heat the grey side of the Stamp Pad Foam with a heat gun. I heated it for about 1 minute. Press the red rubber stamp onto the hot pad. Press the foam stamp onto the craft a board. By creating a foam stamp, you are creating a reversed image of the original. then use the white side of the Stamp Pad Foam to ink the edges of the craft a board. ...until it looks a bit "spooky"
And then use the same foam pad to chalk the edges with pitch black ink. Assemble the card and add 2 button accents to anchor the main panel. I added some machine stitching to add interest. Stamp a spider accent next to the sentiment and add a dew drop to the spider's body (I think it looks eerily real, but it adds such a fun touch) As I sit back to look at the finished card, it reminds me of Charlott's web as she hangs out in the barn. This card will be mailed out to someone, for sure...are you with me?